This walk starts from Garsdale Station where it is necessary to get the Little White Bus which meets the Northbound and south bound morning trains. 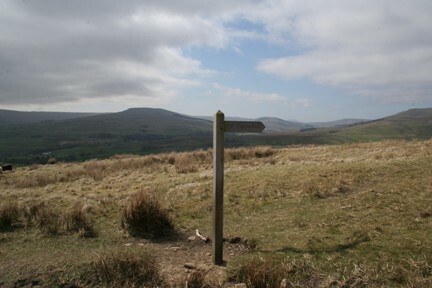 Failing that the walk can be started from Hawes following the Pennine Way to Hardraw which will add an extra mile or so. If arriving by car the bus could be picked up near the Moorcock Inn thus saving a further mile. 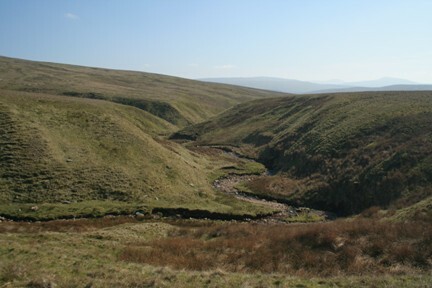 From Hardraw depart the village in a westerly direction and soon turn right onto the Pennine Way track. 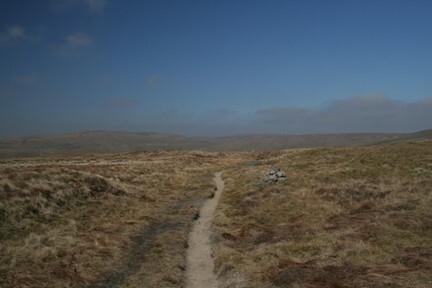 Follow the well defined and signposted track for nearly 5 miles ascending gradually all the way to reach the summit windbreak on Great Shunner Fell [716m]. The views into upper Swaledale are excellent. 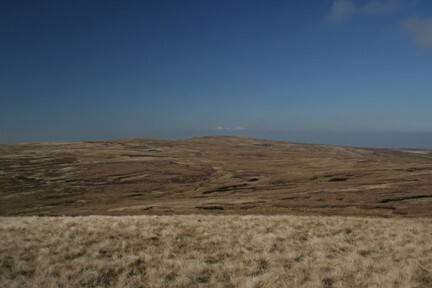 The Tarn seen in the distance is Birkdale Tarn. From the summit bear due west following a fence on the right. The route is easily followed for the next 2 miles down to a gate known as Market Place negotiating a few boggy bits. Passing through the gate bear slightly right [still with the fence on the right] and continue up to Hugh Seat [694m] although beware of a couple of deceptively boggy bits. The terrain is otherwise quite good. 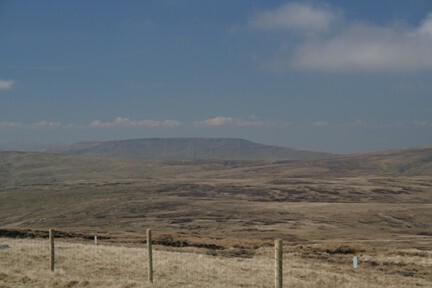 Hugh Seat is an excellent vantage point overlooking the Eden Valley and Wild Boar Fell. 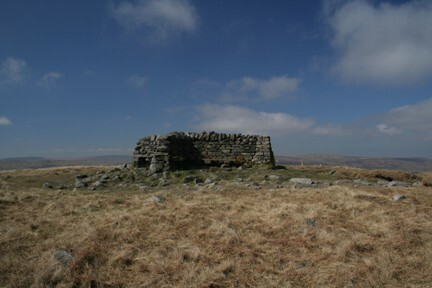 Note the date inscription of 1880 in the cairn. Leave the cairn in a westerly direction heading for a further cairn on the shoulder of hill below with a ravine in the distance - the best plan is to follow the shoulder of hill and descend to where two becks meet crossing one of these to reach the righthand bank. These are in fact the early tributaries of the River Eden. Using a convenient ramp climb to higher ground and proceed with the beck on the left to reach Lady Anne Highway at Hellgill Bridge. Turn left to pass over Hell Gill and about 1/4 mile further on take the left had fork with the vehicles prohibited sign. Follow the highway for nearly 2 miles passing the remains of High Hall and High Dyke with a gate enroute. After High Dyke dip into a ravine with obvious signs of landslips in the past and after 1/4 mile look for a new signpost and bridleway gate to the right. This is in fact the new Pennine Bridleway. Pass through the gate and follow the timber waymark posts down to Cobble Plantation and ten through a gate. Turn left passing Ure Force waterfall and then right over the old bridge, From here follow the bridleway diagonally across the rough pasture to reach the Moorcock Inn.